Media Eagles has conceived, produced, led, and/or launched local, national, and even international campaigns that leverage Hollywood's top talent — whether in front of or behind the camera — to raise important issues, drive awareness, spark action, and drive change. 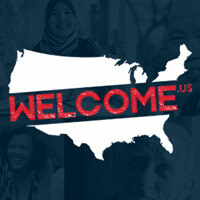 Welcome.us, a non-profit launched in 2014, is dedicated to celebrating a United States that is fueled by an immigrant tradition. The inaugural event centered around a nationwide effort to gather and share inspirational stories of America's shared immigrant experience. Its centerpiece was the launch of Immigrant Heritage Month in June, which featured local activations at the grassroots level, a long list of proclamations from governors and mayors across the country, and an extensive media campaign designed to celebrate the fact that every American is, in one way or another, a part of our immigrant fiber. Media Eagles produced more than a dozen spots to highlight the starring role immigrants have played in the history and culture of the United States. For the month of June, we focused on telling some of the stories that shaped this country. The month included partnerships with corporations, media outlets, organizations, celebrities, and athletes, as well as faith, civic, and political leaders. Our spots featured talent ranging from Jeremy Irons to David Blaine, from Skylar Grey to Sally Field, from Paul Wesley to Macy Gray. Our Honorary Board featured Lawrence Bender, Michael Bolton, Jamie Lee Curtis, Lisa Kudrow, Jason Mraz, and Sofia Vergara, among many others. A Cowboy's Logic: What is American? Burma: It Can't Wait was a 38 spot viral video campaign launched — with much fanfare in Newsweek, on CNN, in the New York Times, and in media outlets around the globe — designed to raise awareness of and drive activism on behalf of Aung San Suu Kyi and the people of Burma. The month-long campaign highlighting the Burmese struggle for liberty, democracy, and human rights featured the release of a different video each day, with the goal of building one million voices in support for Burma. Some of the talent featured in the spots — some of which have been viewed more than 20 million times! — includes Jennifer Aniston, Woody Harrelson, Sarah Silverman, Sylvester Stallone, Eva Longoria, Judd Apatow, Sheryl Crow, James Cameron, Eddie Izzard, Eric Szmanda, Jim Cameron, Sheryl Crow, Matisyahu, Jackson Browne, Joseph Fiennes, Anjelica Huston, and Norman Lear.